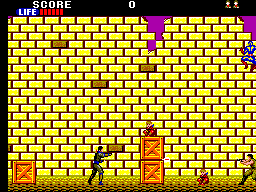 Shinobi is a two-dimensional "arcade platformer". This genre was really strong from approximately 1984 to 1994. 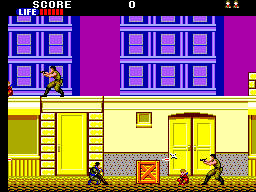 Most games in this style are essentially the same: move your character from left-to-right (sometimes up-and-down and right-to-left), collect items for points and "power-ups", and destroy baddies along the way. Often there is a powerful "boss" at the end of the level (or several levels). Shinobi does not stray from this formula. You are a ninja master, with a mission to save the children of government leaders kidnapped by the Ring of Five (the arcade story differs slightly). Fight through 19 levels of intense ninja combat until you reach the final showdown! The SMS version of Shinobi has what I call "intermediate" graphics. This means they are more detailed than most of the '86-'87 batch of games, but not always up to par with post-'88 visuals. Most of the arcade's "look" is intact, with some reduction in sprite animations. There is also no parallax scrolling (the effect where the background moves slower than the foreground and gives the screen depth) and some of the bosses have no background. Despite this, the game still looks quite good. Each level has its own unique style. Perhaps it's because I've played the game so many times, but I can usually tell exactly which level a screenshot is taken from. This is due to the variety of colour and detail the SMS programmers put into the graphics. I'm going to have a bit of trouble explaining this, but then again, all music is difficult to describe in words. The best I can do is to say that Shinobi has high-energy "Asian-themed" music. The melodies give the game a Japanese vibe. Whether they are authentic Japanese melodies, I don't know. However, the music definitely helps give the game an Eastern vibe while enhancing the mission. The sound effects are somewhat standard...I'm not sure what the standard is exactly, but the effects don't really stand out to me, and are thus generic. Except for one: Jo's voice! I was always impressed when SMS games had short voice clips. They add a little life to the digital characters on-screen. Don't get me wrong; the sound effects are not bad at all! Just not necessarily amazing. This is an excellent home version of an awesome arcade game. 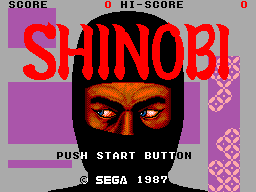 Shinobi is the reason I bought a Sega Master System in the first place, so many years ago! While suffering a little in the move from high-powered arcade hardware to a home console, any omissions (whether graphically, sonically or control-wise) are made up for with the new home-version-only weapons like knives, nunchakus, bombs, and grappling chain. Remember this commercial? Kid (to friends): "Alright...the game is Shinobi. 19 levels of major, MAJOR ninja arcade entertainment! You got your throwing stars, your bombs, your nunchakus..." *cue announcer* "Shinobi...just one of over 70 games for the Sega Master System! System and games each sold separately." Yes, that has stuck in my head for almost 2 decades now :) Thanks for reading my review, and enjoy playing this great game!